The kitchen countertop is undoubtedly the most heavily used surface in most homes. Under constant threat of heavy impacts, contact with high heats and sharp objects, kitchen countertop materials must be strong and durable. Additionally, the kitchen is an important selling point for most home buyers, so the addition of an attractive countertop often adds value to the entire home. A comparison of the characteristics and value of types of kitchen countertops allows you to choose the right material for your home. Polished granite counters are attractive and durable. Prized for their attractive appearance, granite countertops are one of the most durable types of kitchen counters. Granite is a dense, impact-resistant stone and, if properly finished, buffs to a glossy shine. Additionally, granite withstands a wide range of temperatures. Granite installers apply permanent, water- and grease-proof surface coatings to granite countertops. Although granite countertops are highly resistant to impact damage, glossy surface coatings easily show nicks and cuts. To conceal cut marks, granite counters require occasional refinishing. Ceramic tile and porcelain tile are the most common types of tile used to cover kitchen countertop surfaces. Porcelain tiles are heated at higher temperatures than ceramic tiles, resulting in a dense, extremely water repellent material. However, ceramic and porcelain tile are similar in both installation and durability. Both types of tile are more prone to cracking and chipping than granite countertops and tile installations result in the creation of small mortar joints, called grout lines, which eventually discolor and require refinishing. Stainless steel countertops are usually single counter units that consist of an integral top, backsplash and lip. Stainless steel varies in price according to the thickness, or "gauge," of the material and the composition of the metal. Stainless steel counters resist all types of stains, water damage and temperatures. However, stainless steel is a relatively soft metal and easily develops noticeable scratches and cuts. Laminate is generally the most affordable type of kitchen countertop material. Laminate countertops consist of a thick slab of particle board covered in a decorative, wear resistant laminate sheet. 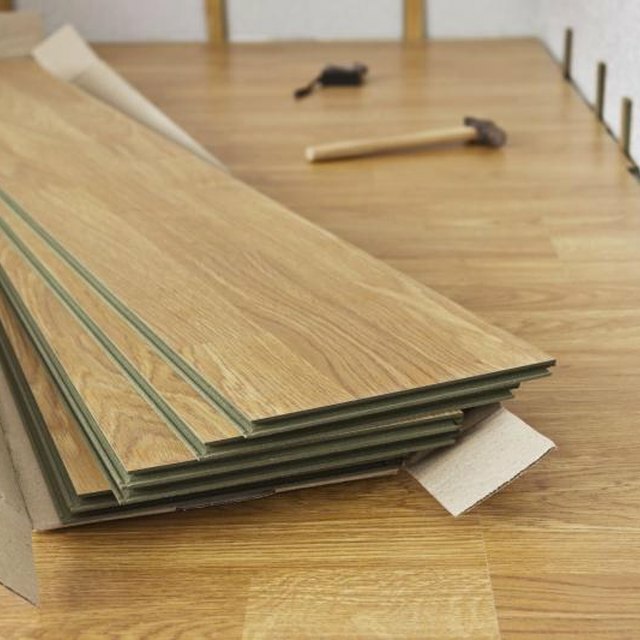 Although the composition of laminate counter sheets varies according to manufacturer, laminates are typically composed of plastics and resins. Home improvement stores sell laminate countertops as ready-to-install units, complete with counter, lip and backsplash. Laminate withstands substantial impact damage, but easily scratches and suffers from discoloration under high temperatures. The construction of a poured concrete countertop requires labor and expense comparable to the construction of granite countertops. Similar to granite countertops, concrete counters withstand heavy impact and high temperatures, and resist gouges. However, concrete countertops are heavy and typically require more framing and support than other types of counters. Additionally, improperly sealed concrete surfaces become permanently stained by grease and moisture. What Is a Post-Form Laminate or Formica Countertop? What Kind of Plywood for a Granite Tile Countertop?